Bubo nipalensis a zo ur spesad evned-preizh bras eus ar c'herentiad Strigidae. Bevañ a ra diwar vronneged bihan, evned, pesked ha stlejviled. B. n. nipalensis, eus menezioù Himalaya da greisteiz India ha reter da Viêt Nam. (en) Bubo nipalensis war al lec'hienn BirdLife International. 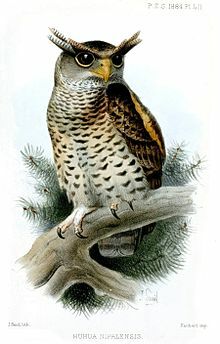 (en) Bubo nipalensis war lec'hienn an International Union for Conservation of Nature (IUCN). ↑ (en) Roadennoù IOC World Bird List diwar-benn Bubo nipalensis. Kemmoù diwezhañ degaset d'ar bajenn-mañ d'an 17 Ebr 2019, da 19:24.